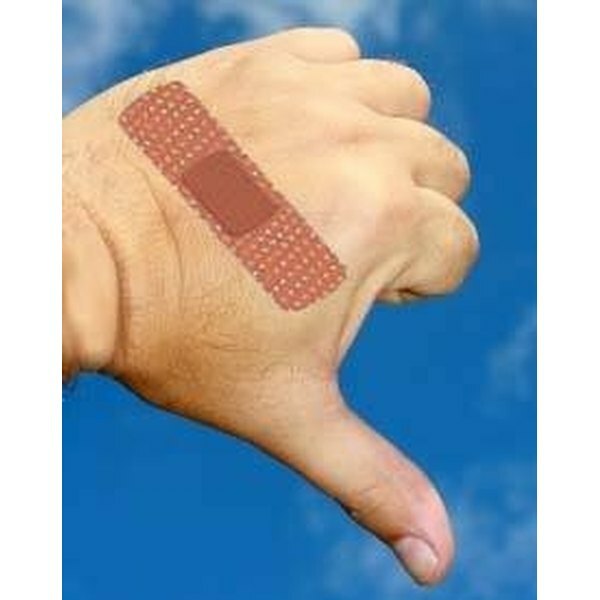 Whether you are trying to remove a common Band-Aid product or hospital adhesive tape applied over a more significant wound, getting the bandage off can be made less painful by following some simple steps. Loosen the bandage by placing a damp, warm washcloth over the bandage for roughly 10 minutes, or until the edges of the bandage start to loosen. Rewarm the washcloth as needed. Gently work up the edges all around the bandage and begin to lift it away from the skin. If it's still too difficult or painful to remove, place the warm, damp washcloth on the exposed parts of the skin, where the bandage has already been removed, and slowly work the bandage off the skin. Holding the skin taunt helps in bandage removal. Remove leftover adhesive by using common products you have around the house. Dab a washcloth generously with vegetable oil and gently rub the area where the adhesive has been left behind. Mineral oil or baby oil can be used by pouring a small amount onto a cotton ball, paper towel or washcloth and placing it over the adhesive for a minute or so. Gently rub the sticky stuff away. Soak a cotton ball or paper towel with nail polish remover with acetone, and gently wipe the area to remove the adhesive. Make sure the wound has healed completely before removing the bandage. Nail polish remover has a strong smell and may irritate sensitive skin.